Kure Beach, N.C.: Fort Fisher State Historic Site commemorates the 151st anniversary of the 2nd battle of Fort Fisher on Saturday, January 16 with a program that pays tribute to Medal of Honor Recipients. The living history program “Distinguished by their gallantry in action: Fort Fisher’s Medal of Honor Recipients” will feature free Civil War lectures by compelling authors and speakers, dozens of Union and Confederate reenactors, special tours, cannon firings and artillery demonstrations. The site will also debut a new exhibit in the visitor’s center that highlights the 72 soldiers, sailors, and Marines who received the Medal of Honor for their actions at Fort Fisher near the end of the Civil War, from June 1864 to January 1865. Although never presented to their recipients, five Medals of Honor on loan from the U.S. Navy will be among the articles featured in the exhibit. Visitors can also expect ground-shaking firings of the site’s 32-pounder rifled and banded cannon, a 12-pounder Napoleon cannon and a 10-pound Parrott Rifle. The site’s Junior Reserves program, “Attention Cannoneers!,” will educate visitors about Civil War artillery (11:00 a.m.-2:00 p.m.). Using math and science, visitors can hone their artillery skills by launching water balloons with the site’s artillery simulator. Other activities include an intriguing Confederate currency presentation by Buena, Vista, Va., native David Meisky, a reenactor and historian who will portray William “Extra Billy” Smith, a Confederate general, businessman, and politician. A former history major at George Mason University, Meisky is retired from the Fairfax County, Va., Public Library. He will speak at 11:00 a.m. in the site’s auditorium. Then at 2:30 p.m., local historian and author Richard Triebe will discuss Fort Fisher POWs and sign copies of his books. Fort Fisher State Historic Site is located in Kure Beach, just 20 miles south of Wilmington, at 1610 Fort Fisher Blvd. S., along US Highway 421. The living history program begins at 10:00 a.m. with activities and lectures throughout the day until 4:00 p.m. The anniversary program is free, with the exception of special tours that charge a modest fee. Visitors, residents, and motorists are advised of loud explosions during cannon firings and artillery demonstrations. Until the last few months of the Civil War, Fort Fisher kept North Carolina’s port of Wilmington open to blockade-runners supplying necessary goods to Confederate armies inland. By 1865, the supply line through Wilmington was the last remaining supply route open to Robert E. Lee’s Army of Northern Virginia. Many battles were fought leading up to the war’s end. The Second Battle of Fort Fisher on January 15, 1865 was the largest land-sea battle of the Civil War. When Fort Fisher was captured after this massive Union amphibious assault, the South’s vital shipping port of Wilmington was closed and the war ended less than 90 days later. Programming is made possible with the support of the Friends of Fort Fisher and its sustaining members. Fort Fisher is part of the Division of State Historic Sites in the N.C. Department of Cultural Resources. Due to factors beyond the staff’s control, some program components are subject to change. For more information on the site, call (910) 458-5538 or visit the web site www.nchistoricsites.org/fisher/. Event information can also be found at www.friendsoffortfisher.com. If your favorite pastime is “past times,” then plan a weekend getaway to experience Fort Fisher’s 151st Anniversary commemoration. 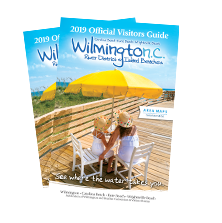 For a free Official Visitors Guide to Wilmington, North Carolina and the island beaches of Carolina Beach, Kure Beach, and Wrightsville Beach, call 1-866-266-9690. For online visitor information, visit the official destination website at www.WilmingtonAndBeaches.com.